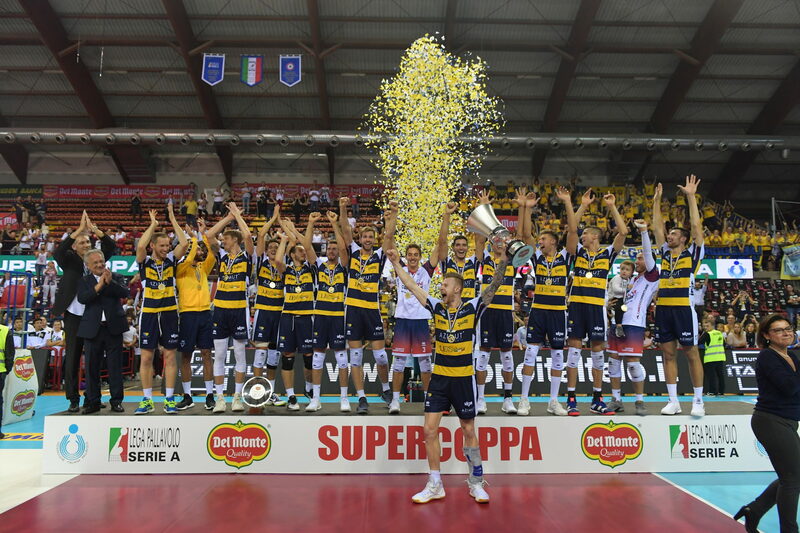 After a season of turmoil that saw the exodus of their coach, their setter, and one of the most dynamic outside hitters in the world, Azimut Leo Shoes Modena regrouped to claim the first trophy of the season in the Italian SuperCoppa against a resilient Itas Trentino side. Julio Velasco had not been with his team much since the his Argentinian team bowed out of the FIVB World Champiosnhips, and 6 of their 7 starters reached at least the Final Six. They were still able to put together an impressive week of volleyball with a new lineup to defeat a pair of quality teams. Ivan Zaytsev is back at opposite and has picked up the role of being the primary offensive weapon after his time at Perugia on the left side. He led the match with 25 points on 24 kills and 1 block. Zaytsev hit an impressive .552 (63%) in the victory. Bartosz Bednorz, fresh off of winning the Polish PlusLiga with PGE Skra Belchatow, got the start for Modena and scored 11 points. While his 7 kills came with a -.037 hitting percentage (27%), he contributed 3 points from the service line. Tine Urnaut contributed 10 points on 10 kills with a .185 hitting percentage (37%). Max Holt scored 10 from the middle on 8 kills, 1 block, and a service ace. Holt hit .583 (67%) in his 12 attack attempts. Simone Anzani produced 5 points from the other middle blocker position from 2 kills, 2 blocks, and 1 ace. Micah Christenson set Modena to a .314 (48%) hitting percentage. He posted team-highs with 2 blocks and 4 aces. The American setter was named the SuperCoppa Most Valuable Player. Christenson’s teammate with the US National Team, Aaron Russell, led his new team with 21 points. Russell put away 17 kills with a .464 (61%) hitting performance. He also chipped in 2 blocks and 2 service aces. Uros Kovacevic scored 14 points on 13 kills and a block. Luca Vettori scored 12 points on 10kills, 1 block, and 1 ace. This performance must be bittersweet for Aaron Russell. After leading Perugia to their first Italian Superlega championship in club history, he was shown the door in favor of Filipino Lanza. The club felt the need to find another Italian outside hitter when they brought in Wilfredo Leon. Perugia ended up going 0-2 this weekend while Russell made great strides in the first weekend with his new club. Osmany Juantorena and Enrico Cester got the day off for Lube, and despite a rough start and 24 points from Aleksandar Atanasijevic, they secured 3rd place. Lube got 17 points from the Cuban duo of Yoandry Leal and Robertlandy Simon. Tsvetan Sokolov saw time in limited capacity and scored 1 point as he recovers from a knee injury. Wilfredo Leon scored 13 points on 11 kills and 2 blocks. Filippo Lanza also put away 11 kills and finished with 11 points on the night in the loss. Atanasijevic scored 24 points, as mentioned earlier. He led the match with 17 kills and 6 blocks.